AT&T has released a press release (below) that details their plans for new iPhone and iPad data plans, and that most likely doesn’t mean good news if you are an AT&T customer. The carrier has decided to get rid of their $30 unlimited plan and introduce two new plans priced at $15 and $25, with the $25 plan being capped at 2GB/month with a $10 fee for each additional GB. 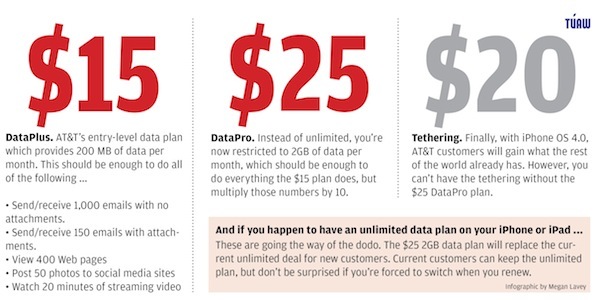 They also introduced official tethering prices, which will cost you an extra $20 monthly. Current iPhone and iPad users will be able to keep their current plans under “grandfather” status, but this is of course only until their contract runs out. You can also rush out and get on one of AT&T’s current unlimited plans, as the new data plans wont take effect until June 7th (the same day the new iPhone is set to launch during Steve Jobs’ keynote at WWDC). Full press release below if you’re interested. DALLAS, June 2, 2010 – AT&T*, the U.S. smartphone leader, today introduced new wireless data plans that make it more affordable for more people to enjoy the benefits of the mobile Internet. Customers can pick the new data plan that best meets their needs – either a $15 per month entry plan or a $25 per month plan with 10 times more data. Current smartphone customers are not required to switch to the new plans, but can choose to do so without a contract extension. Each plan includes unlimited access at no additional charge to more than 20,000 AT&T Wi-Fi Hot Spots in the U.S. Customers can also use unlimited Wi-Fi at home, in the office or elsewhere if available. AT&T will also help customers manage their wireless data usage by sending free text messages when customers reach different usage intervals, and by providing online tools, including a smartphone app that shows monthly usage information. The new wireless data plans – including a new tethering option – will be available beginning June 7. Current AT&T voice and texting plans are unchanged. * DataPlus. Provides 200 megabytes (MB) of data – enough to send/receive 1,000 emails (no attachments), send/receive 150 emails with attachments, view 400 Web pages, post 50 photos on social media sites and 20 minutes of streaming video – for just $15 per month. This plan, which can save customers up to 20 percent off their wireless voice and data charges, is designed for people who primarily like to surf the web, send email and use social networking apps. If customers exceed 200 MB in a monthly billing cycle, they will receive an additional 200 MB of data usage for $15 for use in the month. Currently, 65 percent of AT&T smartphone customers use less than 200 MB of data per month on average. * DataPro. Provides 2 gigabytes (GB) of data – enough to send/receive 10,000 emails (no attachments), send/receive 1,500 emails with attachments, view 4,000 Web pages, post 500 photos to social media sites and watch 200 minutes of streaming video – for $25 per month. Should a customer exceed 2 GB during a billing cycle, they will receive an additional 1 GB of data for $10 for use in the month. Currently, 98 percent of AT&T smartphone customers use less than 2 GB of data a month on average. * Tethering. Smartphone customers – including iPhone customers – who choose the DataPro plan have the option to add tethering for an additional $20 per month. Tethering enables customers to use their smartphone as a modem to provide a broadband connection for laptop computers, netbooks or other computing devices. Tethering for iPhones will be available when Apple releases OS 4.0 this summer. With the new wireless data plans, pricing for a smartphone voice and data bundle now starts at just $54.99 per month for an individual plan, or $24.99 per month for an additional line on a FamilyTalk plan, $15 per month less than the price of the previous entry level bundle. For new iPad customers, the $25 per month 2 GB plan will replace the existing $29.99 unlimited plan. iPad customers will continue to pre-pay for their wireless data plan and no contract is required. Existing iPad customers who have the $29.99 per month unlimited plan can keep that plan or switch to the new $25 per month plan with 2 GB of data. The vast majority of smartphones that AT&T offers have built-in Wi-Fi, which lets the devices automatically switch from the wireless network to a Wi-Fi hotspot without prompting, making Wi-Fi even more convenient and easy to use. This enables customers to use Wi-Fi in the home, office and at public locations where available. Using Wi-Fi does not count against a customer’s monthly data plan usage total. In addition, virtually all AT&T smartphone customers have access at no additional charge to more than 20,000 AT&T Wi-Fi Hot Spots at Starbucks, Barnes & Noble, and other U.S. locations. Customers can get more information on how to use Wi-Fi and find the location of AT&T Wi-Fi Hot Spots at www.att.com/wifiaccess. * Customer Text Notifications On Data Usage. When customers begin to approach their monthly usage limit, AT&T will send three text notifications – when they reach 65 percent, 90 percent and 100 percent of the threshold. Customers will also be sent emails if AT&T has their email address. * Data Usage Monitoring. Additionally, customers with iPhones and other select devices can use the free AT&T myWireless application to check data usage. The application is available for download in several smartphone app stores. Also, AT&T customers can call *DATA# from their wireless phone to check their data usage for the current billing period. They receive a free text message with their usage information. Customers can also go online to www.att.com/wireless to see all their usage information, past and present. * Data Calculator. The easy-to-use online data calculator enables customers to estimate their mobile data usage and get a better sense for which data plan is right for them. It’s located at www.att.com/datacalculator. Customers can learn more about the new plans online at www.att.com/dataplans, by contacting AT&T customer service at 1-800-331-0500, or by visiting an AT&T retail store. AT&T expects these new data plans to have minimal revenue impact this year and to not affect previous guidance for 2010. Pingback: Dell Streak Tablet Coming to the U.S. Unlocked and Affordable! Next Entry: Dell Streak Tablet Coming to the U.S. Unlocked and Affordable in July!